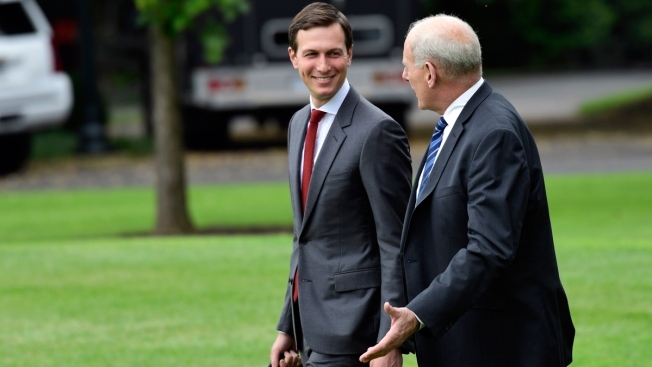 In this file photo, White House senior adviser Jared Kushner, left, and chief of staff John Kelly, right, talk as they walk towards Marine One on the South Lawn of the White House in Washington, Wednesday, June 27, 2018 for a short ride to Andrews Air Force Base in Maryland. Rep. Elijah Cummings of Maryland, the chairman of the House Oversight and Reform committee, has been investigating security clearances issued to senior officials including Kushner. A career official in the White House security office says dozens of people in President Donald Trump's administration were granted security clearances despite "disqualifying issues" in their backgrounds, including concerns about foreign influence, drug use and criminal conduct. The allegations were detailed in a letter and memo released Monday by Rep. Elijah Cummings of Maryland, chairman of the House Oversight and Reform Committee. The documents, which are based on Newbold's March 23 private committee interview, don't identify the officials on the list but say they include "two current senior White House officials, as well as contractors and individuals" in different parts of the Executive Office of the President. "According to Ms. Newbold, these individuals had a wide range of serious disqualifying issues involving foreign influence, conflicts of interest, concerning personal conduct, financial problems, drug use and criminal conduct," the memo says. The release of the documents sets the stage for another fight between the White House and the Democratic-controlled House, and immediately drew criticism from House Republicans who called the allegations overblown and "cherry-picked." Cummings' panel has been investigating security clearances issued to senior officials including Trump son-in-law Jared Kushner, former national security adviser Michael Flynn and former White House aide Rob Porter. That probe has picked up steam after The New York Times reported that Trump ordered officials to grant Kushner a clearance over the objections of national security officials, and after Newbold spoke out to NBC News and other news outlets about her concerns. White House press secretary Sarah Sanders said on Fox News on Tuesday that she could not talk about individual security clearances, but asserted that Democrats were "acting in bad faith" because they are asking for personal, confidential information "they know they have absolutely no right to see." "Let's not forget 3 million Americans have security clearances that work for the government. By exploiting one, you're exploiting all of their personal information," Sanders said. Rep. Jim Jordan, the committee's ranking Republican, said in a statement that Cummings' probe is a "partisan attack" and an "excuse to go fishing" through personnel files. He also said that one person on Newbold's list is a GSA custodian. Also, in a response memo circulated to Republican members, Jordan's staff cast Newbold as a disgruntled employee who had only limited knowledge of the reasons security clearances were granted. The Republican document also suggests Newbold's concerns were "overblown," saying that four or five of the clearance denials for "very serious reasons" were a small fraction of about 5,000 employees who work in the Executive Office of the President. According to Democrat Cummings' memo, though, Newbold considered the decisions to be part of a "systematic" problem within her office where the decisions of security clearance reviewers were "continuously" overridden. Newbold said that when she returned to work in February, she was cut out of the security clearance process. The office also announced a plan to "restructure" that would remove her from a supervisory role, she said. In response to Newbold's interview, Cummings is asking the White House to turn over the list she created as well as documents related to the handling of security clearances for several senior officials including Flynn, Porter and Kushner. Flynn maintained his clearance even after the White House learned that he lied to the FBI about his conversations with Russia's ambassador and that he was under investigation by the Justice Department for his previous foreign work. Kushner responded to the security clearance issue Monday night on Fox News' "The Ingraham Angle" by saying he and others in the Trump administration have been the subject of "crazy accusations." "Over the last two years that I've been here I've been accused of all different types of things, and all of those things have turned out to be false," Kushner said. He said he's complied with "all of the different investigations" and "disclosed all my holdings" to the Office of Government Ethics. Asked whether he posed a grave security concern to the country, Kushner said, "I can say that in the White House I work with some phenomenal people and I think over the last two years the president has done a phenomenal job of identifying what are national security priorities."